Six years ago, I was traveling home from Ft. Lauderdale (on a business trip) when the plane I was in hit terrible turbulence. It was huge plane; the kind with 2 seats on the left, 2 on the right, and 3 in the middle. It’s rare that you can feel rough air in planes that big. But this, felt like someone was literally shaking the plane. It was so bad that the pilot suspended beverage service and told the flight attendants to sit down. It was awful and I remember it like it was yesterday. I remember that one of sister reps took my hand and we began to pray (out loud) and in a matter of moments, a peace came over us and the plane. Eventually the turbulence subsided and we landed. The worst part about all this was that I had an hour layover until I had to get on a-nother plane! My GOD. I was terrified…and to be honest, I have been terrified to fly ever since that time. I think I was around 23 then and that was the first time I became aware of my own mortality. On another occasion, (also when traveling on business), we flew into a snow storm. The storm was pummeling the city, and there had been so much ice and snow that the airport literally closed while we were in the air. We had to hover above the airport in a hold pattern for 20 minutes while they cleared a jet way for us. Meanwhile the elements swirled around us like a cyclone and if felt like Mother Nature herself was rocking our plane like a newborn. Terrible, horrible, very bad, no good experience! Even after all these years, those two experiences are as vivid in my mind as my high school graduation, my first kiss, and the first time someone told me they loved me. I remember the pounding in my chest, my sweaty palms clutching the arm rests, the jumbled clutter of non-denominational prayers ringing in my head. You would think that after such terrible experiences I would never get on a plane again. You would think that I would have driven across country to my cousins wedding last summer. Or that I would have taken a train to my surprise anniversary celebration in Miami two weeks ago. Or maybe that I would have skipped my writers conference this past weekend in NYC. But, I didn’t. I went and I flew. Now don’t get me wrong…it was painstaking. On the 4 hour flight to my cousin’s wedding in Vegas, I actually took 4 Dramamine. And since, I had to do Miami and NYC on back to back weekends; I had a shot of Jack on both of those flights. (Don’t judge me…It is what it is).But at the end of the day, I did it. I got on the plane. I sat in the seat and I made it through. I decided I would take my own advice and try to replace my fear with enthusiasm. So I made a calculated attempt to enjoy my flight. I really tried to enjoy it. I made an effort to look out the window, marveling at the clouds and the little lights scattered beneath us. I thought about the lives and people inside those lights. I talked to the flight attendants, and other passengers on the plane. I figured thinking about these things was better than imagining myself plummeting from the sky! It worked. And I was a little more at ease. The thing about traumatic events is that sometimes you carry the memories and the scars with you for years. Many of us can recall with ease previous feelings of pain, betrayal, and fear. We use these memories and feelings as an excuse to check out of certain parts of lives. People, who have been hurt, decide that love is a fairytale. People who have been lied to believe that trusting others is naive and stupid. And people, who have had bad experiences on the arrow-plane, refuse to fly. 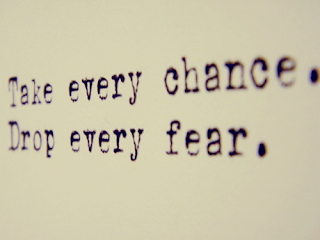 In the end we all have two choices, we can let our fear control us or we can move forward in the midst of our fear. I’m not here to tell you that it’s going to be easy. Because most likely it won’t be. It’s hard for me to get on a plane, every time I have to do it. But as I am thinking of all the bad things that could happen I am reminded that the only thing I wanted more than never getting on that plane was to get off of it and go home. Thoughts of my cousin’s smiling face and my auntie’s warm arms comforted me. I knew they would be waiting for me, and the anticipation of that gave me the strength I needed to stay in my seat instead of running up and down the aisles screaming. I think…. we all have places that we want to go in life. It’s unfortunate but for some of us, the road to those places is riddled with memories of bad things and scary situations. The universe asks do you have the fortitude…the courage to do it anyway. Do you have faith to do what you have to do in spite of fear? I am afraid of a lot of things, flying being one of them. But from this experience, I have learned that I am not afraid of fear. It’s uncomfortable, but being afraid of something is not a good enough reason for me not to do it. And sometimes all the universe asks of us is that we show up.We all have our reasons, but the universe accepts no excuses! Besides, someone is waiting for you on the other side of your fear. So… weak knees, sweaty palms, and Jack Daniels in hand, I’m going to show up. Scared as hell, but ready ...to fly…..